The discovery of novel RNA species and functions has generated the need for methods to selectively label different types of RNA in order to study their localization, dynamics, and structure both in vitro and in cells. Progress in the field of bioorthogonal chemistry has led to the development of a toolbox of reactions compatible with cellular components—in the best case even with living cells—that are also suitable for RNA modification. The first step, however, is the introduction of a group suitable for bioorthogonal chemistry. Besides chemical synthesis, this can be achieved by various enzymes that (1) either accept non-natural nucleotide-building blocks or (2) modify RNA with non-natural residues. 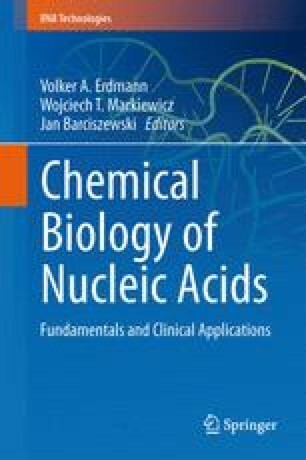 This chapter will first briefly introduce the relevant click reactions and then focus on the different state of the art approaches for modification of RNAs by chemo-enzymatic labeling. We will try to highlight the potential and limitations for broader applications, including future use in cells.